Max A. Pooch "About Me' Maxims to be Introduced on Web Site. Max A. Pooch Maxims are so popular on his profile for the "About Me" contest, they will become a regular feature at Pooch's website. Max A. Pooch has something to say in maxim pics. Sept. 11, 2011 - PRLog -- Deerfield, IL.... Keith Sanderson, Sidekick of Max A. Pooch the recycled dog who recycles, announced today that the popular Max A. Pooch Maxims seeen on Pooch's "About Me" profile page http://www.about.me/maxapooch.com/ will be incorporated as a regular feature on Pooch's web site. The anticipated date that visitors to the Max A. Pooch website, http://www.maxapooch.com will be able to see a Max A. Pooch Maxim is September 21, 2011 one day after the "About Me" contest closes. "Our strategy to post a new Max A. Pooch Maxim each day has proven to be correct," Sanderson claims," It’s given people another reason to visit Pooch's "About Me" profile page and vote for him, and kept his profile in the top five percent. Each new picture we post includes Max A. Pooch saying something humorous. People love them, and they come back for more. " That is what Sanderson wants, people to return to Max's profile and vote for Max, because if he gets enough votes he could have his picture on a billboard on Times Square. The About Me competition runs until September 20, 2011. 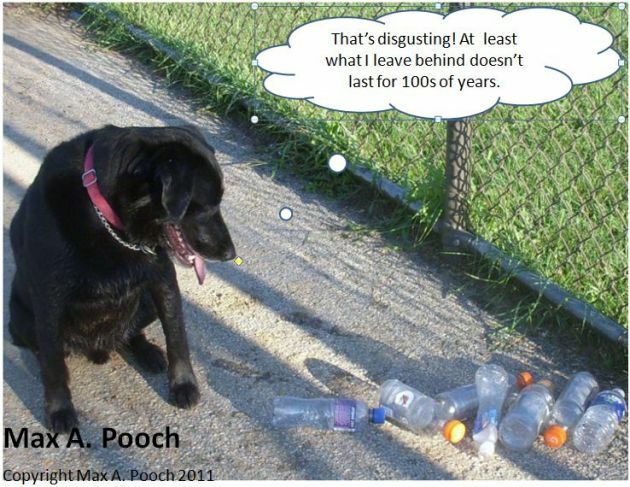 If Max A. Pooch is an About Me winner it will be great for people who love dogs and hate litter, because it will draw attention to Max A. Pooch's messages. The success of Max A. Pooch's Maxims, makes it probable they will be great traffic builders for Max's website http://www.maxapooch.com. The Maxims are a digital photo version of the Garfield the Cat or Marmaduke cartoons providing the readers humor from the character's point of view. Max's story has much appeal to online, video, print, and audiences. It can best be summarized by what Animal Planet's David Mizejewski wrote in his blog about Max. David wrote, "I couldn't resist one more dog-related story because this is so awesome. Check out the video about a "recycled" black lab that is now on a mission to recycle trash. I think this is such a clever and useful way to channel the lab's innate retrieving instinct for the greater good." Max A. Pooch is rapidly growing in popularity because in these times of stress and crisis people are looking for positive messages that communicate an individual can make a difference. "That is perhaps the most important message Max has," says Sanderson of Max who was rescued from an animal control facility by Lincolnshire, IL Orphans of the Storm Animal Shelter. "Max was discarded by his owners. It's appropriate he reminds us we should all stop and think about the consequences of our actions before we act. Something as trivial as throwing a bottle along the roadside will impact us all; or abandoning a dog will create misery, suffering and perhaps the animal's death." Max A. Pooch and Keith enjoy making personal appearances. Keith discusses the three Rs... Reusing, Repurposing and Recycling. He uses Max as an example as something that was discarded and saved. Max now enjoys an opportunity to be reused. He has a new purpose in life and helps find and recycle cans and bottles. Max captures the audience's attention by seeking out and retrieving bottles and cans. Proving reducing litter is so easy a pooch can do it. The demonstration also shows how a recycled dogs instincts can be repurposed. Max A Pooch the recycled dog who recycles helps audiences understand the consequences of their actions. When talking to audiences Sanderson draws the connection between those who trash the planet and those who are responsible for destroying 4,000,000 dogs annually. That connection is whether one is dropping a piece of litter or abandoning a dog his or her action has consequences that can cause environmental damage, financial cost to society, and untold misery for millions of dogs and other animals.